I will have to quote shipping … the site calculator will not be accurate. 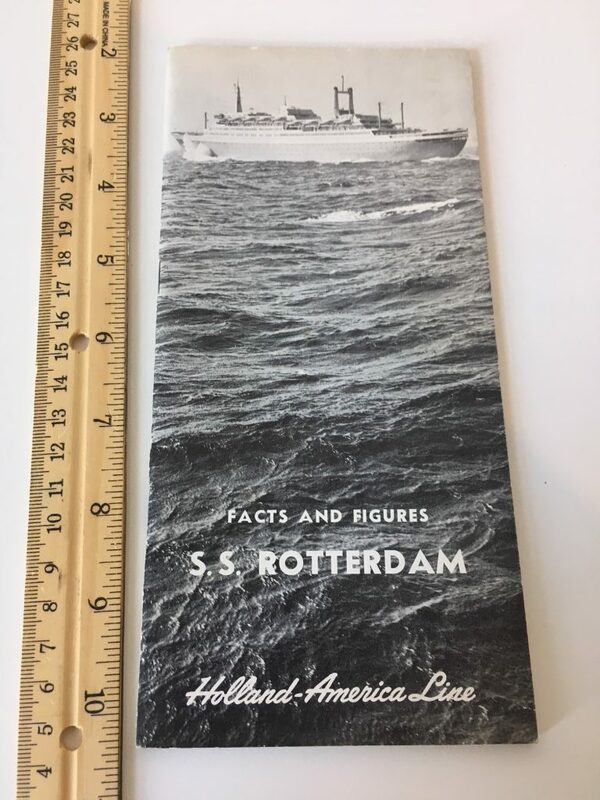 Lovely booklet for the Modern 1959 Dutch Rotterdam. 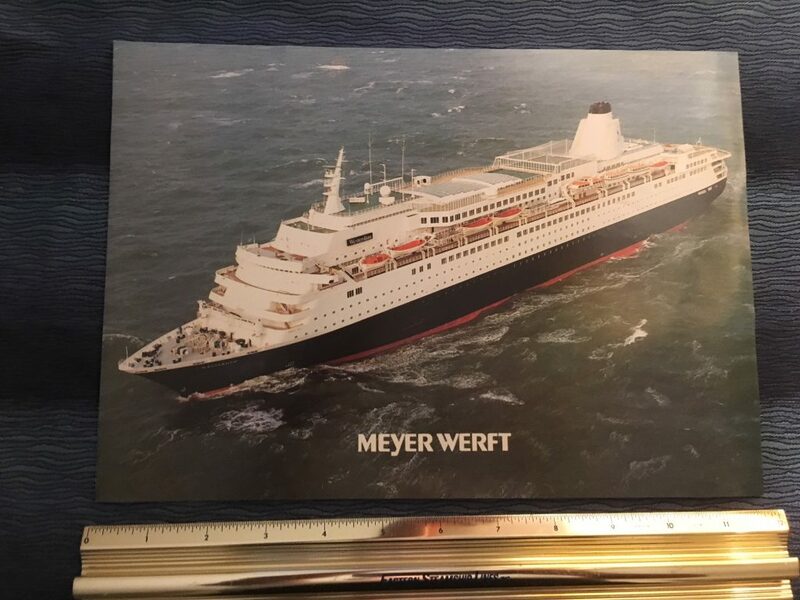 Her Maiden voyage left Rotterdam 9/3/1958, Le Havre on 9/3 as well, Southampton 9/4 and arrived in NYC of 9/11. Excellent condition. 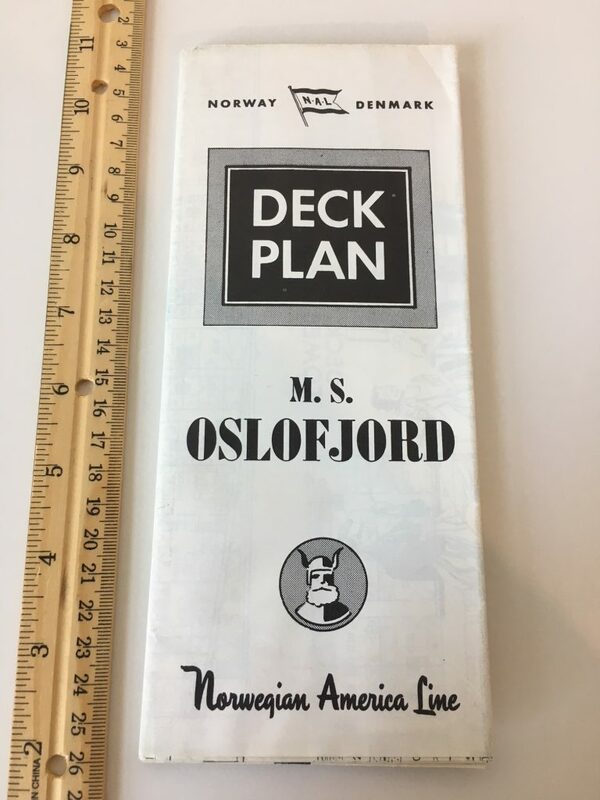 Nice Heavy Tissues Deck Plan for the Oslofjord … my favorite NAL ship for sure . Great condition with a little toning. 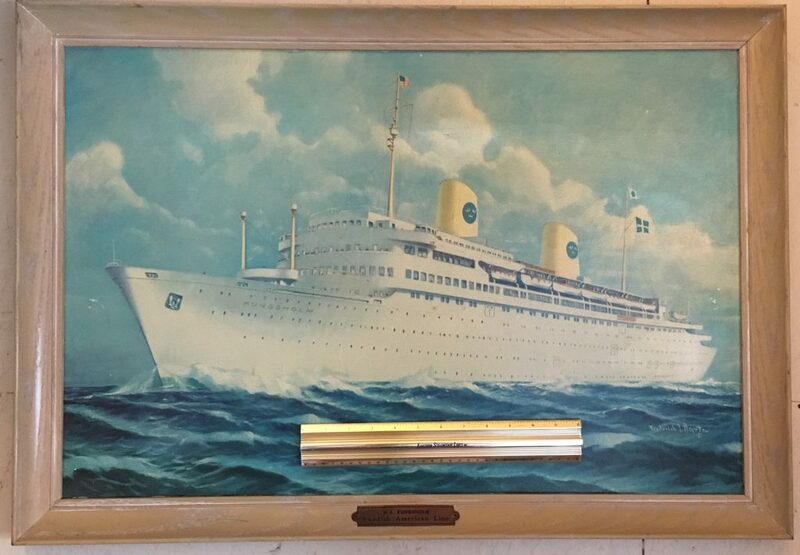 Lovely Agency print for the Gripsholm … SAL’s second large liner for the post war period. 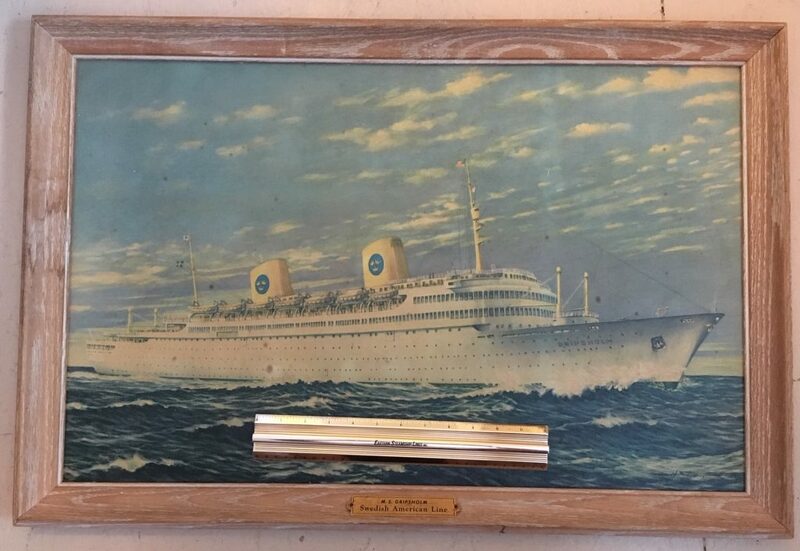 The print and frame are in good condition with the typical expected wear and patina for a 70 year old item. 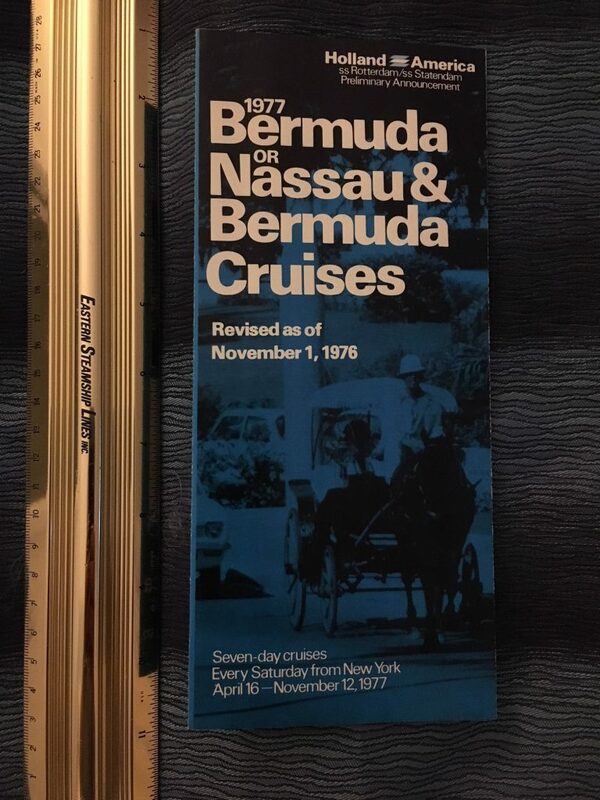 This is from my friend Peter Knego’s personal collection. 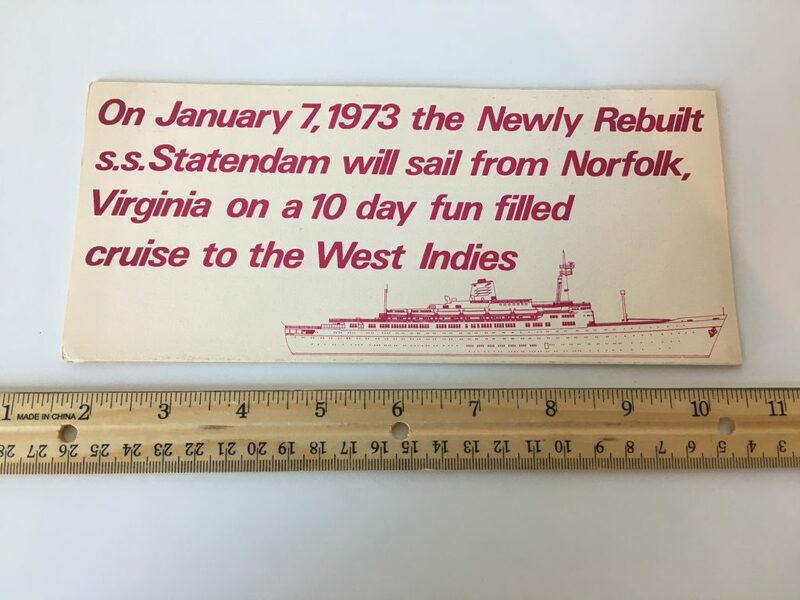 She would later become the Regent Sea for Regency cruises. I will have the quote shipping for this item specifically … the site shipping calculator will not be accurate. Lovely Agency print for the Kungsholm 2 … SAL’s first big post war liner (the little Stockholm has started the post war rebuilding program). 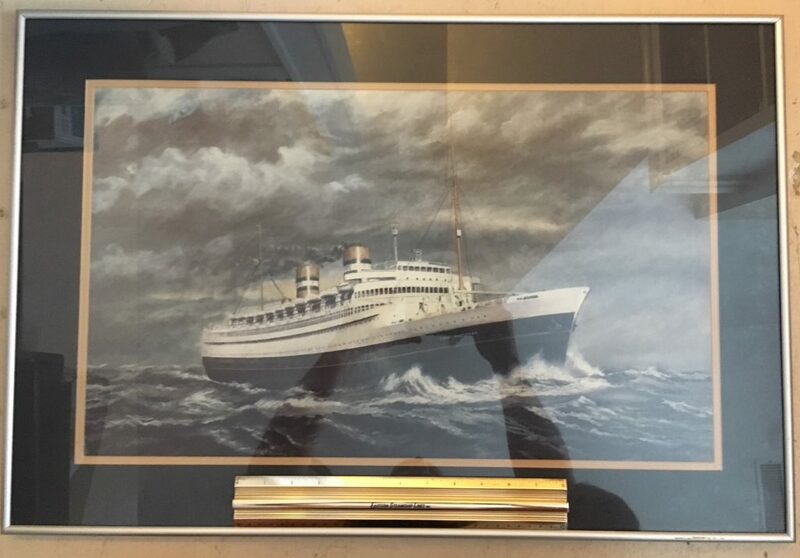 The print and frame are in good condition with the typical expected wear and patina for a 70 year old item. 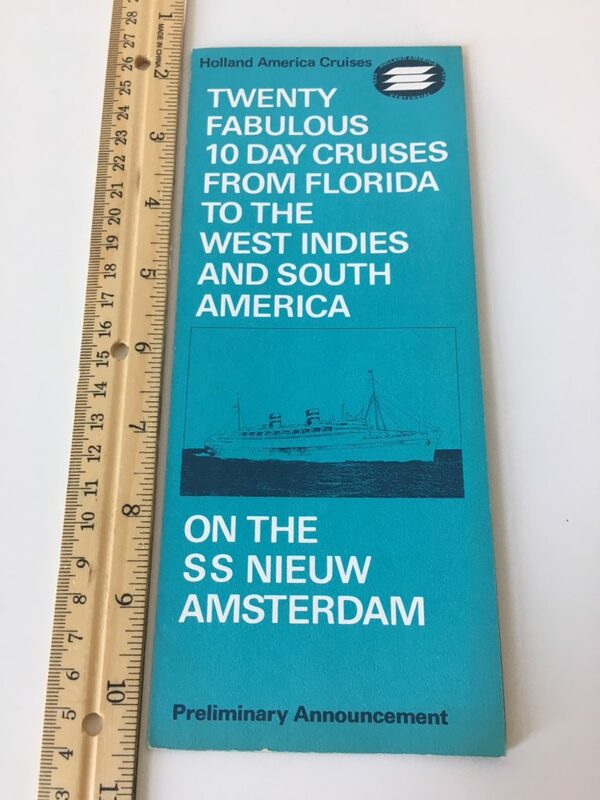 This is from my friend Peter Knego’s personal collection. I will have the quote shipping for this item specifically … the site shipping calculator will not be accurate. 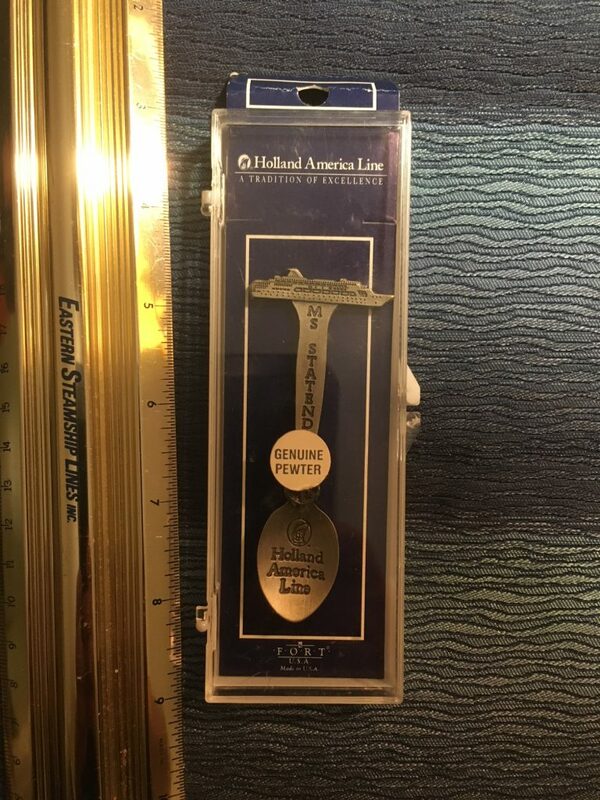 Nice Genuine Pewter spoon for HAL’s last Statendam. Still in the original box. 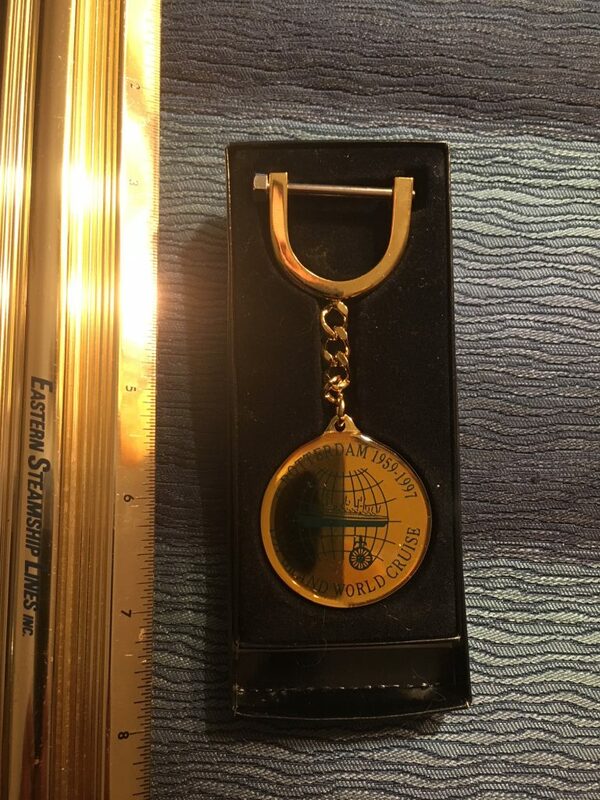 Excellent keychain from the ships last grand world cruise. Excellent condition and still in the original box. She survives today as a lovely attraction in her namesake port. 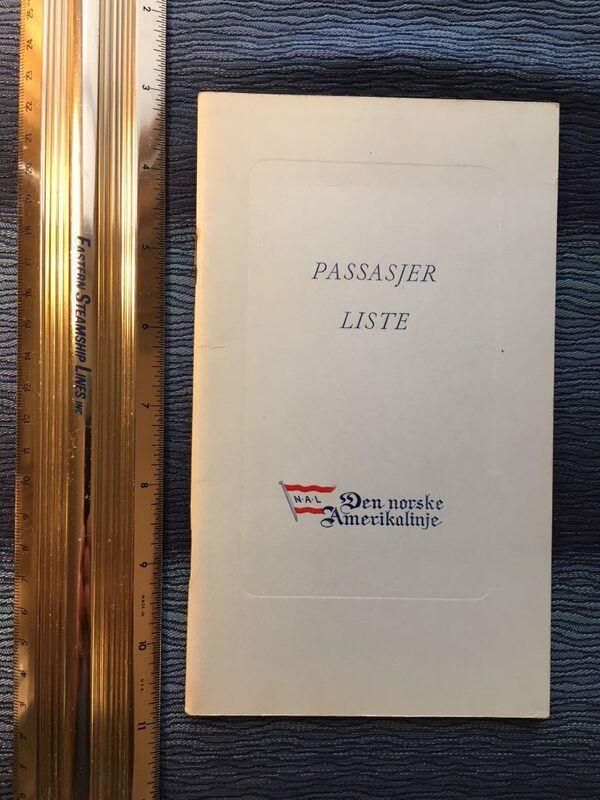 Great little folder for the 77 cruises of the Statendam and the Rotterdam. Excellent condition. 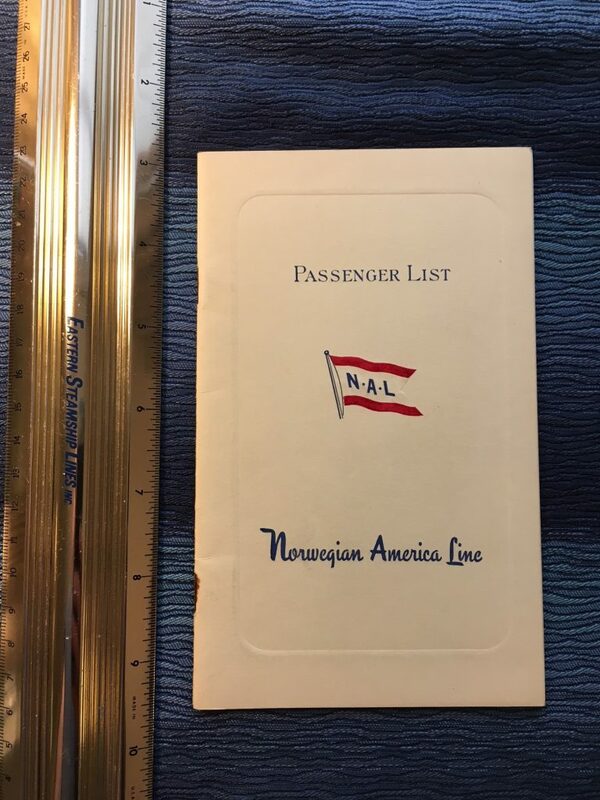 Like new folder for the 1973 sailings for NAL’s last 2 ships. 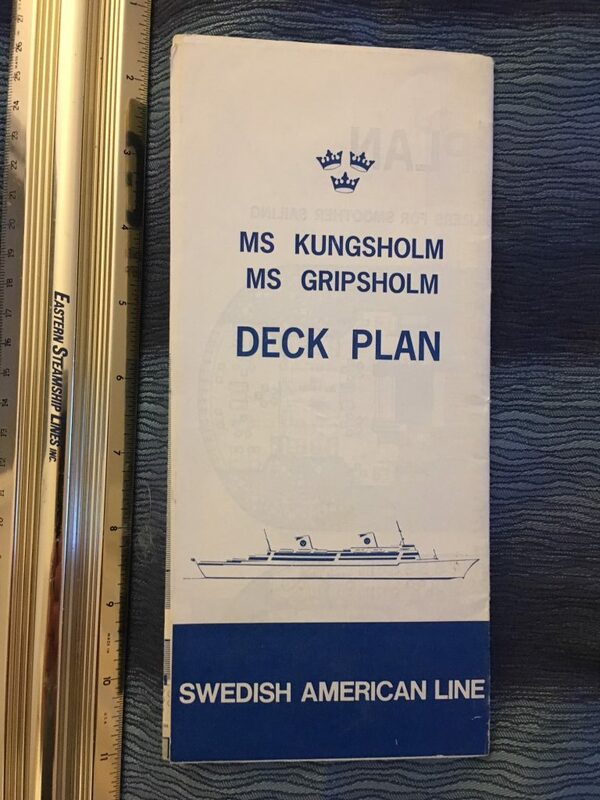 This includes the announcement of the Vistafjord’s Maiden Voyage that Began on May 22..
Great DP for Swedish American’s last 2 ships …the Gripsholm 2 and the Kungsholm 3. 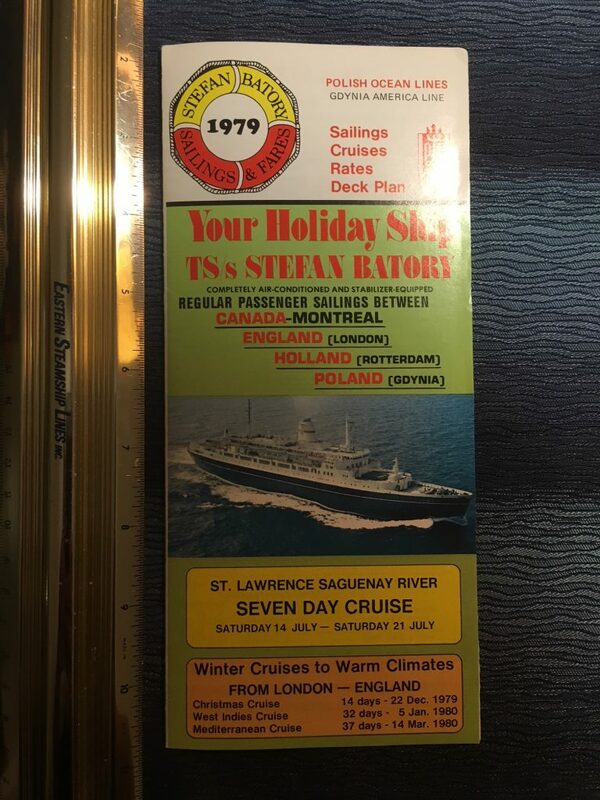 Both ships went onto many years of service after SAL terminated passenger services in the early 1970’s. Printed on glossy paper in Blue and white. 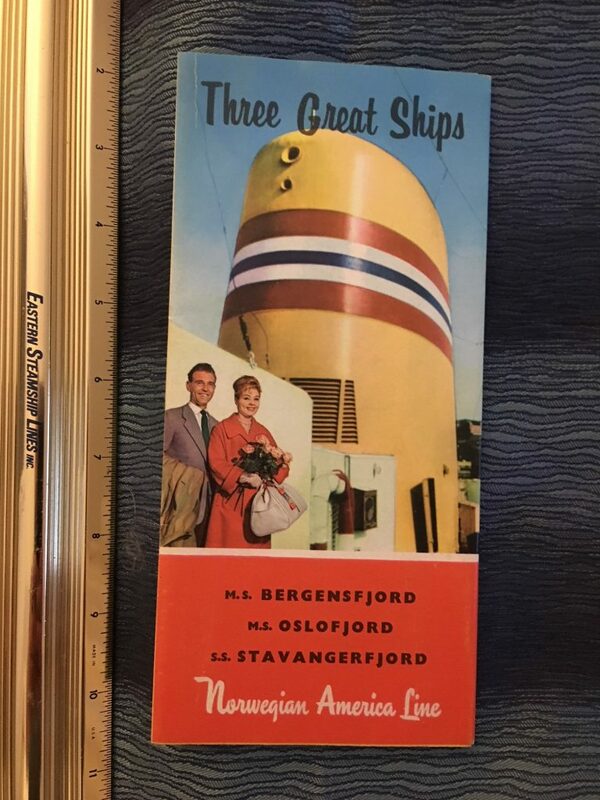 Super colorful and excellent interior and info fold out for the Oslofjord, Bergensfjord and Stavangerfjord. Excellent like new condition. 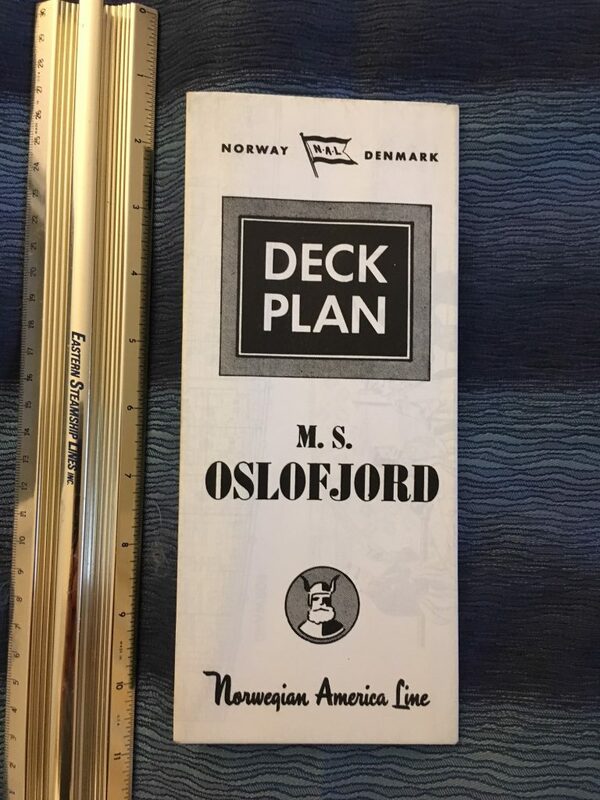 Super nice heavy tissue Deck Plan for my favorite Norwegian Gal! 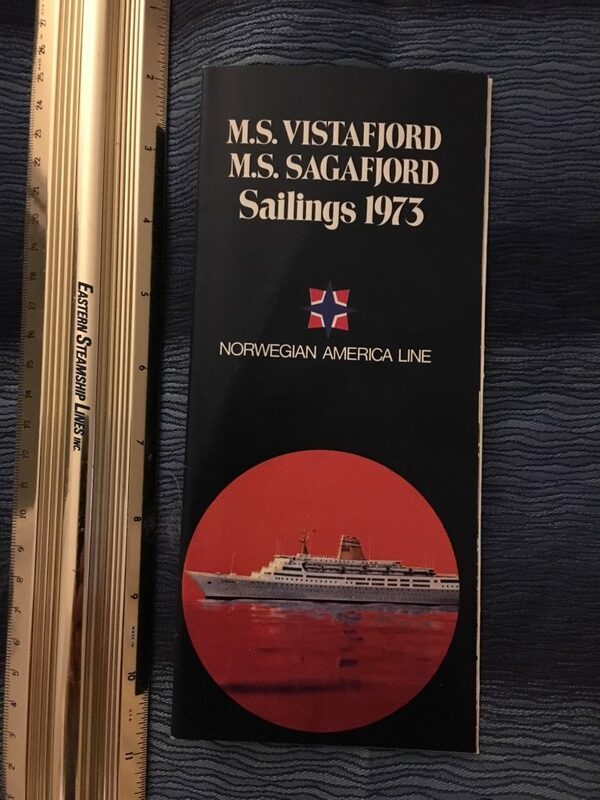 Such super yacht like lines … she was just amazing. 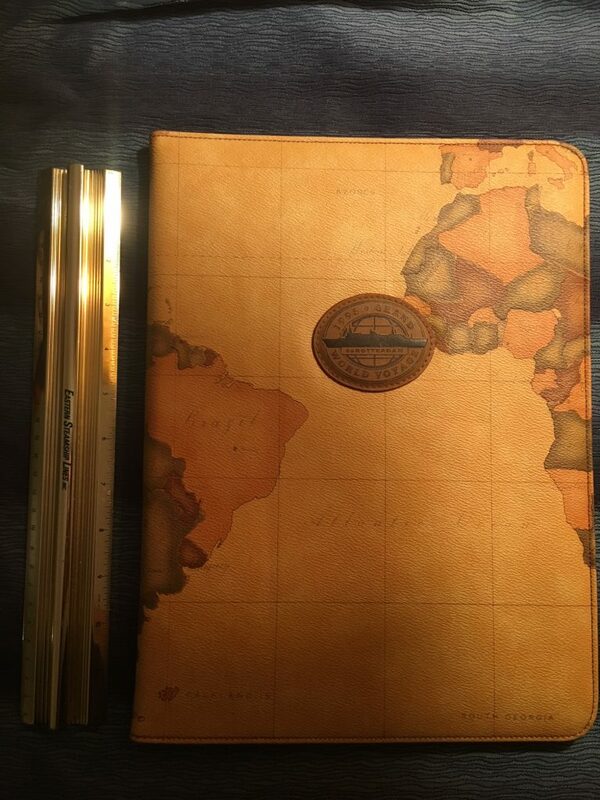 Plans are in excellent like new condition … never been unfolded. 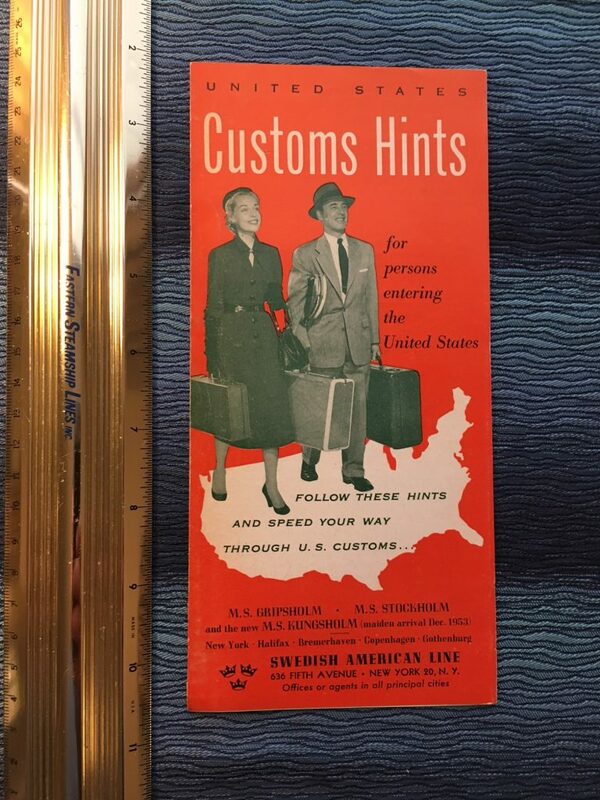 Lovely customs hints brochure for SAL Passengers. 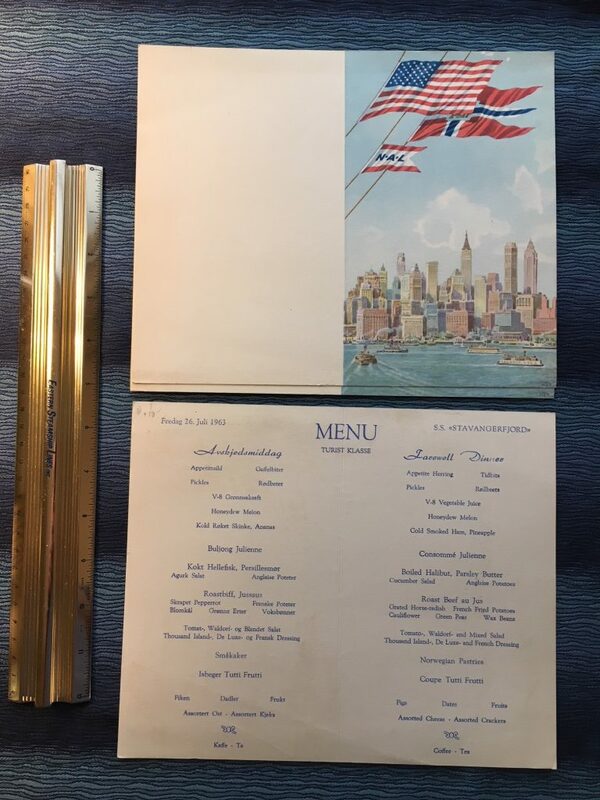 Covers The prewar Gripsholm 1. the New Stockholm and the new Building Kungsholm2 … whose maiden voyage was planned for Dec 1953. Interesting item. 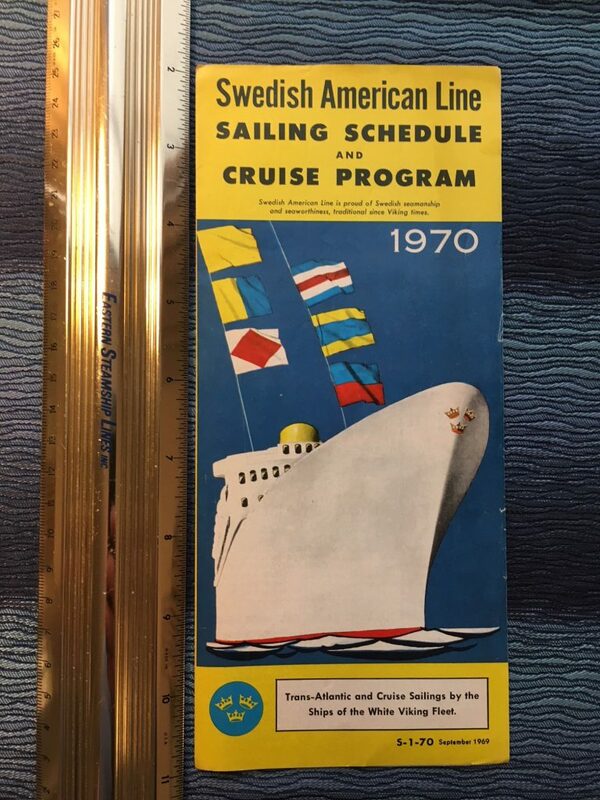 Dated September 1969 for the advance 1970 season … great sailings and cruise flyer. Excellent condition. 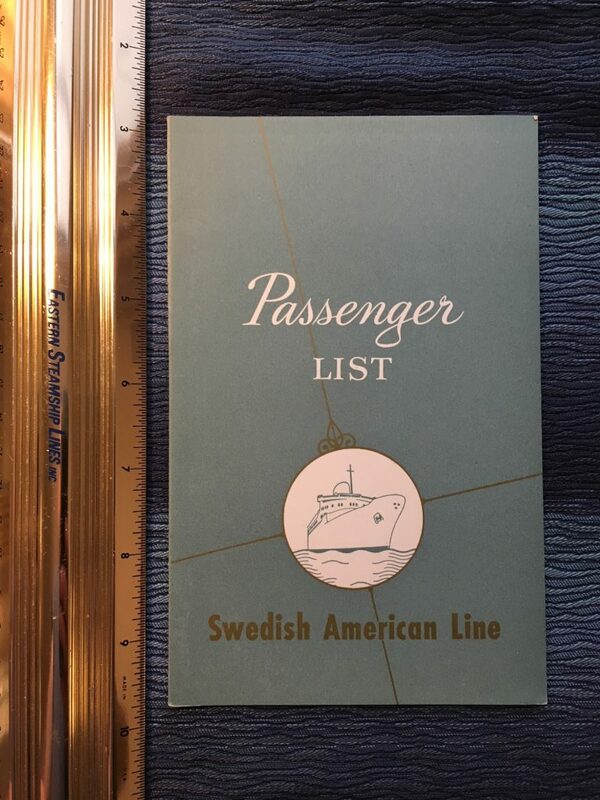 Lost of Transatlantic sailings are still scheduled as well as a hefty Cruise program. 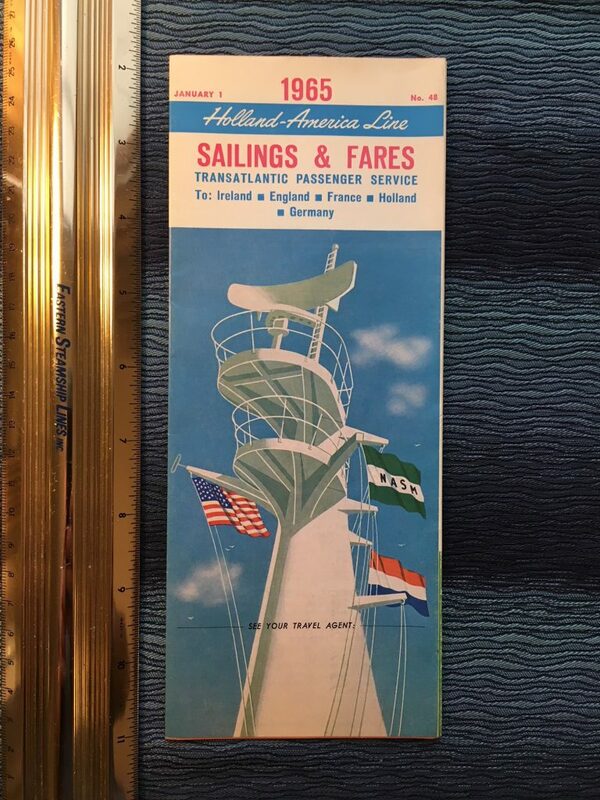 Great fares and sailing schedule dated January 1965 for the HAL fleet …outstanting graphic of the Rotterdams’ Main Mast. 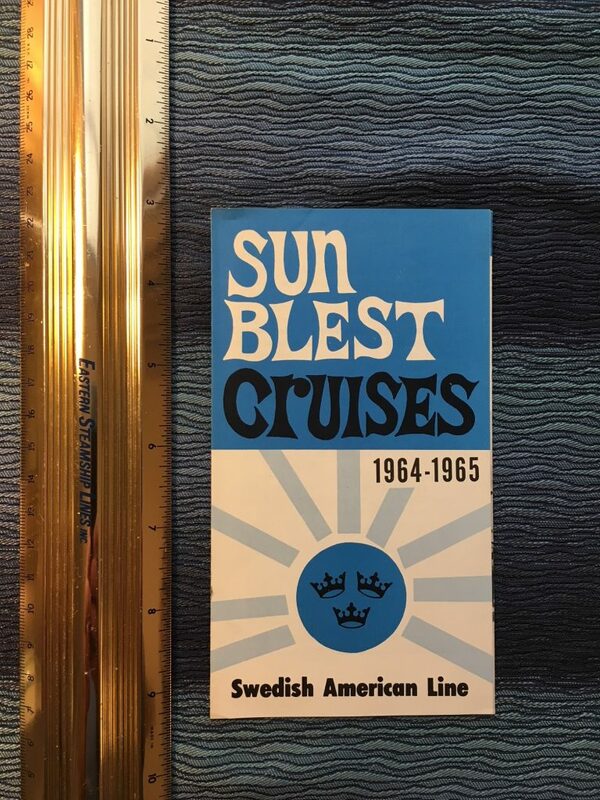 Nice Mini sun blest cruises flyer for the 64.65 season. Like New condition!